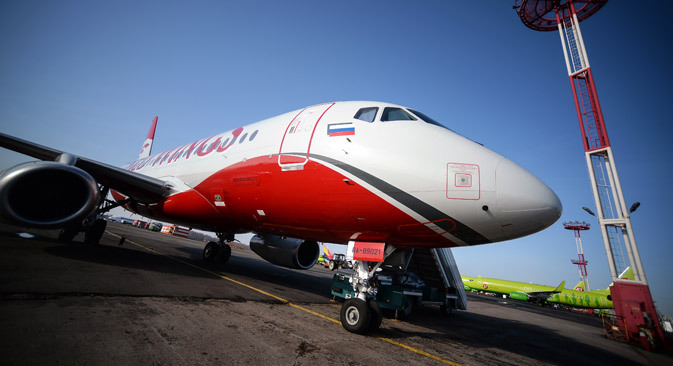 Sukhoi Superject 100 (SSJ-100) at the Domodedovo airport, Moscow Region, on Feb.26, 2015. Sukhoi looks to lease SSJ-100 aircraft to airlines in Asia. Russia’s Sukhoi Civil Aircraft plans to open a representative office in China by the end of this year, official representative of the company told TASS on July 12. The representative office will oversee the setup of a leasing company to sell SSJ-100 jet liners in China. The company, owned by the Russian-Chinese Investment Fund, the United Aircraft Corporation, and China’s New Century International Leasing, plans to lease 100 aircraft to airlines in China and Southeast Asia.